Throughout Mein Kampf, Hitler describes what he calls a world-concept, or Weltanschauung. In its usual sense, the word basically means worldview, but when Hitler uses the term it means an all-encompassing social, philosophical, and political idea that has become politically organized. It contains ideas about economics, history, and the nature and destiny of man. 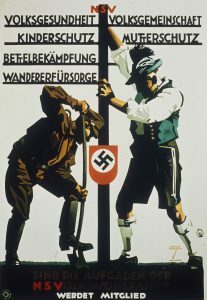 There are two fundamental world-concepts according to Mein Kampf: one that was dominant in the 1920s, namely Marxism, which he also refers to as the international world-concept and social democracy, and the other is the one he sought to replace it with, that is National Socialism, also referred to as the race-based world-concept. These concepts are mostly dealt with in chapters one and five of the second volume of Mein Kampf. This essay is primarily, but not exclusively, a commentary on those two chapters, and how the two world-concepts are presented. The situation in which Hitler found himself in the 1920s was in some respects better than the current situation the Right finds itself in, and in other respects worse. What was worse was the immediate threat of the Communists, their organized violence and the tremendous power they wielded over German society (not to mention others). The political instability and the specter of a revolution directed from Soviet Russia made life in Europe precarious. However, ethnocentrism was much more prevalent then, and nationalist ideas had much popular support. Today, the specter of Marxism has lost it edge. There is no organized Marxist party about to seize power. The powerful world-concept that Hitler describes is gone. However, Marxism has become subtler and has permeated everything in our culture. This we rightly call Cultural Marxism. The seed of the old world-concept is still there, doing what it does best: dissolving European culture, while waiting for its chance to get organized, waiting for a new black magician. We can call ourselves lucky, in that what remains of the old world-concept is mostly manifested in terms of negative criticism. A world-concept cannot be led to victory by degenerate, walking-dead intellectuals, and this gives us pause. While the general state of the Right today is abysmal and incoherent, apart from the ethnonationalist Right, the Left is similarly disorganized. Of course, behind Cultural Marxism, just like the Marxism of yore, are Jews in great numbers. But, what happened after the creation of Israel in 1948 and heightened anti-Semitism in the Soviet Union in the 1950s was that many Jews defected from the internationalist Marxist movement and joined the anti-Communist movement, or became neoconservatives. Having a country seems to reduce one’s enthusiasm for internationalism. This division within organized Jewry would have been such a blessing, had not the Right become even more crazy and corrupt! But “the hour is ripe and yonder lies the way,”  said Virgil. We cannot let the crazy, cucked Right distract us. We must simply write them off unless they come over to our side. The identitarian-ethnonationalist right represents a great new awakening. A new world concept for the twenty-first century is coming into being. We must continue our work. We owe it to posterity. It is our sacred duty. The two world-concepts, international Marxism and race-based National Socialism, are diametrically opposed to one another. For Hitler, the former would lead to the destruction of mankind, but the latter to its salvation. In the 1920s, Marxism was long established, well-organized, and well-financed, but the race-based idea, despite having popular support, was disorganized and had no clear aims. Many parties and groups in the so-called Völkisch movement competed for support from German nationalists. Hitler thought that the disunity of the Right in the face of a united Marxist front was a deadly situation. He saw it as his mission to unite the German nationalists, give the race-based world-concept a clear and practical aim, and organize it politically so that it could fight Marxism head-on. Up until 1920 there was no flag that opposed Marxism, at least not one which would have represented its direct opposite as a World-Concept . . .
Hitler’s words that “Marxism’s ultimate goal is and always will be the destruction of all non-Jewish national states” are as true now as ever before. They are eternally true. Though the face of Marxism has changed from an economic doctrine and dictatorship to the subtle Cultural Marxism of today, its goal remains the same. The interest it serves is the same. Or should I say, the people it serves is the same? The idea of an evolutionary group strategy propounded by Kevin MacDonald is very helpful in getting a good and scientific grasp of this. Even though organized Jewry has split into two main factions, the liberal Left and the neoconservative Right, this division is in appearance only. The ultimate aim of both these movements remains the same. Their only difference is that of means to the end, and not the end itself. They also differ from Marxism only with regard to means. The final aim is and always has been the destruction of white countries, white nations, and all that we hold dear. Just look at what it is that most of the mainstream political movements hold as non-negotiable. They may differ on issues such as economics, ecology, urban planning, foreign interventions, social issues, and so on, and they remain polite mostly when debating those. But when the issues of immigration, or repatriation, or worse, race, are brought up, the mood changes. They sense the presence of an enemy, an existential enemy, and recoil in horror, and react with hatred. These are thoughts that cannot be uttered in their presence. These are thoughts that must be destroyed. The survival of the good is anathema to the evil. Heinrich Weinel, “Richard Wagner and Christianity”, The American Journal of Theology, Vol. 7, No. 4 (Chicago: The University of Chicago Press, 1903), p. 609. Virgil, The Book of Ancient Wisdom: Over 500 Inspiring Quotations from the Greeks and Romans, ed. Bill Bradfield, (New York: Dover Publications, Inc., 2005), p. 89. Adolf Hitler, Mein Kampf, (Wewelsburg Archives, 2018), p. 414, retrieved from archive.org . For a Few Dollars More (Sergio Leone, 1965).